Professors in the University have recommended ways in which agriculture can take its pride of place by contributing meaningfully to national development. According to Professor Eniola Fabusoro of the Department of Agricultural Extension and Rural Development (AE&RD), College of Agricultural Management and Rural Development (COLAMRUD), poor funding had been the bane of low agricultural productivity by rural farmers. The Head of Department of AE&RD, stated that from his experience in working with rural people over the years, he had understood the plight of the rural farmers, which bordered mostly on funding and inadequate facilities and equipment. According to him, agriculture should be adequately funded while farmers should be well taken care of. Government should also provide capital through the micro-finance agencies that are presumed to be closer to the farmers. He challenged government to support farmers in order to produce in large quantities, even as he encouraged the establishment of farmers’ cooperative to facilitate access to funding. The University Don recommended that farmers should organise themselves into cooperatives, to ease the problem of collateral for individual farmers and advised that government subsidised agricultural facilities to make farming attractive. Similarly, an expert in Animal Husbandry, Professor Fredrick Smith of the Department of Animal Physiology, College of Animal Science and Livestock Production (COLANIM), has advised government to properly monitor the influx of cattle coming into the country, using appropriate agencies. Professor Smith declared that if animals that come into the country through the borders are well monitored, revenue generated from them could serve as a source of alternative income generation for the country. “We must first take care of our borders. We should not allow just anything to come in through our borders. Our borders should be kept and managed by government agents”, he added. Professor Smith called on government to equip agencies that monitor the country’s borders to effectively monitor inflow of animals into the country. Emphasising the importance of animal husbandry and livestock farming, Professor Smith stated that it was an avenue towards addressing the issue of food insecurity currently facing the country. Corroborating Professor Smith, a Professor of Poultry Science, Professor Obafemi Idowu, stated that livestock farming could sustain the country’s economy. According to Professor Idowu of the Department of Animal Nutrition (COLANIM), the country is blessed with the needed resources, expertise and technical knowhow. “If in Nigeria as a nation, we are determined and we are resolved to be self-sustaining in terms of livestock production, it is a goal that is achievable. We have the resources, we have expertise, the technical knowhow we also have”, he declared. 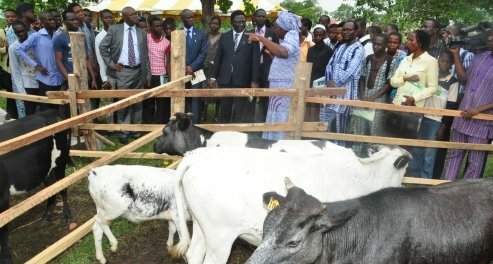 Professor Idowu, who stated that the way forward for the country was in livestock farming, added that “with the good agricultural terrain that we have in the country, life-stock self-sustainability is possible”. Enumerating the challenges that poultry farming was facing, Professor Idowu said they include change in policies when not properly monitored, lack of laws to back the policies made and the attitude of the players, who do not seem to allow these policies to be effective. He frowned at the importation of frozen chickens into the country through the borders and advised that government should ensure that policies made are properly monitored and enforced. He further solicited for financial assistance from government to assist farmers. Meanwhile, Professor Victor Olowe has also observed that as a way to addressing the problem of funding, practicing farmers could now access loan in the University, to boost their activities. Professor Olowe, who is the Director, Agricultural Media Resources and Extension Centre (AMREC), decried non-availability of agricultural loan for the practicing farmers, saying “Access to agricultural loan is the major problem most farmers are facing”, stressing that this had caused most farmers not to be able to fund the enterprises they engage in. He disclosed that in fulfilling the extension services mandate of FUNAAB, AMREC was giving soft loans to practicing farmers that met the laid down requirements of the Centre. This programme, according to him is tagged “Project Monitoring and Evaluation (PME)”, which had started since 2012 as a means to ease the funding problems of farmers and monitor farming projects of the University. The soft loan, which attracts only five per cent interest with monitoring for three months before the farmers start paying back, “is a very accessible loan for farmers who had the requirements to access the loan”, he added. He explained the step-by-step process to accessing the loan to include applying to the Centre, presentation of a workable budget and programme, which AMREC would assess and then establish the viability of such an enterprises. After which, the intending farmer would pay N500, to obtain the form. Other requirements include filling of a guarantors’ form, by the guarantors presented. This is to ensure safety, in case of any eventuality; the guarantor would be liable to offset the loan. Professor Olowe said that since inception of the programme, about 20 farmers had benefited from the soft loan without any default. He also frowned at inadequate funding of agriculture in the country, stating that 10 per cent of the total country’s budget was supposed to be for agriculture but rather, about 4.5 per cent was being budgeted for, as he advised farmers that obtained loans to always pay back, as such gesture was not a commonly-talked about national cake.